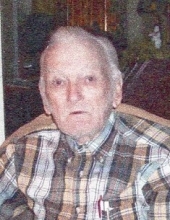 Arnold Okel Smith, age 96, of Varney, Kentucky passed away September 15, 2018 at his home. Arnold was born to the late Lizzie Smith Murncil on November 13, 1922 at Brushy, Kentucky. He spent Most of his life living on Brushy except for the few years he lived at Aflex, Kentucky. Arnold worked for N & W Railroad 41 Years, 9 Months, and 25 days. He has been retired for 35 years. He spent his life enjoying the simple things. He loved the outdoors and was a dedicated bee keeper. Along with his parent he was preceded in death by his wife Garnett May Murphy Smith March 3, 2005, his son Dr. Matthew Richard Smith July 6, 2015, and one brother Edward Murncil. Mr. Smith is survived by his daughter, Kathy Sue Bentley of Raccoon, Kentucky and sister, Faye Lambert of South Williamson, Kentucky. Arnold will truly be missed and forever remembered by his many friends and family. To send flowers or a remembrance gift to the family of Arnold Okel Smith, please visit our Tribute Store. "Email Address" would like to share the life celebration of Arnold Okel Smith. Click on the "link" to go to share a favorite memory or leave a condolence message for the family.